A lifetime ago I graduated as an environmental biologist. I was one of those kids who did well in school, but had no idea what his vocation was. As a pimply teenager with minimal life experience, how was I to know even half the jobs that existed? After much dilly dallying, I eventually drew upon my nerdy interest in science and my idealistic zeal for conservation and applied for a BSc. And while I eventually left the science industry, I consider myself extremely fortunate to have studied the discipline because it has been the backbone of my career. Science taught me to think about the world in a logical, systematic manner. It’s a way of thinking that is founded on statistics, and I maintain it should inform the activities we undertake in other sectors of society such as Learning & Development. The lectures I attended and the exams I crammed for faded into a distant memory, until the emergence of learning analytics rekindled the fire. Successive realisations have rapidly dawned on me that I love maths and stats, I’ve floated away from them over time, the world is finally waking up to the importance of scientific method, and it is high time I refocused my attention onto it. So it is in this context that I have started to review the principles of statistics and its contemporary manifestation, analytics. My exploration has been accompanied by several niggling queries: what’s the difference between statistics and analytics? Is the latter just a fancy name for the former? If not, how not? Overlaying the post-modern notion of data science, what are the differences among the three? Is a data scientist, as Sean Owen jokingly attests, a statistician who lives in San Francisco? 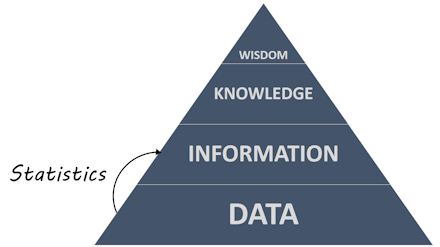 At the base of the pyramid, Data is a set of values of qualitative or quantitative variables. In other words, it is the collection of facts or numbers at your disposal that somehow represent your subject of study. For example, your data may be the weights of 10,000 people. While this data may be important, if you were to flick through the reams of numbers you wouldn’t glean much from them. 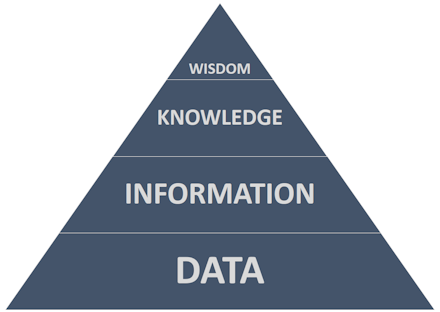 The next step up in the pyramid is Information. This refers to data that has been processed to make it intelligible. For example, if you were to calculate the average of those ten thousand weights, you’d have a comprehensible number that is inherently meaningful. Now you can do something useful with it. The next step up in the pyramid is Knowledge. To avoid getting lost in a philosophical labyrinth, I’ll just say that knowledge represents understanding. For example, if you were to compare the average weight against a medical standard, you might determine these people are overweight. The highest step in the pyramid is Wisdom. I’ll offer an example of wisdom later in my deliberation, but suffice it to say here that wisdom represents higher order thinking that synthesises various knowledge to generate insight. For example, the wise man or woman will not only know these people are overweight, but also recognise they are at risk of disease. Some folks describe wisdom as future focused, and I like that because I see it being used to inform decisions. My shorthand definition of statistics is the analysis of numerical data. In practice, this is done to describe a population or to compare populations – that is to say, infer significant differences between them. For example, by calculating the average weight of 10,000 people in Town A, we describe the population of that town. And if we were to compare the weights of those 10,000 people with the weights of 10,000 people in Town B, we might infer the people in Town A weigh significantly more than the people in Town B do. Similarly, if we were to compare the household incomes of the 10,000 people in Town A with the household incomes of the 10,000 people in Town B, we might infer the people in Town A earn significantly less than the people in Town B do. Then if we were to correlate all the weights against their respective household incomes, we might demonstrate they are inversely proportional to one another. Thus, our statistical tests have used mathematics to convert our data into information. We have climbed a step up the DIKW Pyramid. My shorthand definition of analytics is the analysis of data to identify meaningful patterns. So while analytics is often conflated with statistics, it is indeed a broader expression – not only in terms of the nature of the data that may be analysed, but also in terms of what is done with the results. For example, if we were to analyse the results of our weight-related statistical tests, we might recognise an obesity problem in poor neighbourhoods. Thus, our application of analytics has used statistics to convert our data into information, which we have then translated into knowledge. We have climbed another step higher in the DIKW Pyramid. My shorthand definition of data science is the combination of statistics, computer programming, and domain expertise to generate insight. Or so I’m led to believe. Given the powerful statistical software packages currently available, I don’t see why anyone would need to resort to hand coding in R or Python. At this early stage of my re-discovery, I can only assume the software isn’t sophisticated enough to compute the specific processes that people need. Nonetheless, if we return to our obesity problem, we can combine our new-found knowledge with existing knowledge to inform strategic decisions. For example, given we know a healthy diet and regular exercise promote weight loss, we might seek to improve the health of our fellow citizens in poor neighbourhoods (and thereby lessen the burden on public healthcare) by building sports facilities there, or by subsidising salad lunches and fruit in school canteens. Thus, not only has our application of data science used statistics and analytics to convert data into information and then into knowledge, it has also converted that knowledge into actionable intelligence. 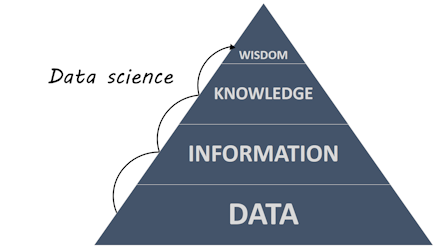 In other words, data science has converted our data into wisdom. We have reached the top of the DIKW Pyramid. This entry was posted on 3 June 2017 at 7:54 and is filed under analysis. You can subscribe via RSS 2.0 feed to this post's comments. Cheers, Neil. I like what you say about what helps people move from one stage to the next. Indeed that’s the interesting bit! Thanks for this post Ryan, it’s very timely for me. I am just starting to get my head around people analytics :) The Wharton coursera people analytics course was a good intro..your explanation above complements it nicely. Hi Ryan! Interesting exploration of the cocept of data and its relationship to meaning and insight. 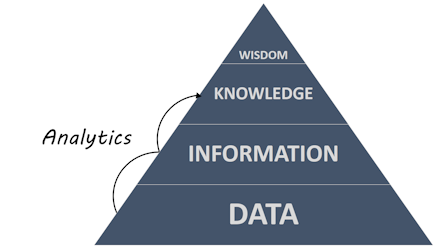 What is your view on the practical application of data in the real world to support decision making? In my jaunt in the business I have been using, collecting and analysing a fair bit of data, & having conversations with the business about what and how data is captured (with the goal of trying to find connections between what we train and the impact on performance & business outcomes). I have been loving working with data in this way, but what you do find is that not a lot is always captured, or accurately or consistently – especially if it is entered manually. But some data is always better than none…providing you understand the underlying flaws and assumptions embedded in it. Data quality and our ability to source it in the first place are two big problems I see in using analytics to support decision making in the real world. This article in Forbes identifies these bugbears and more from the data scientist’s pov – “Cleaning Big Data” https://goo.gl/Q46jws – and even this assumes the data is valid. However, another more insidious problem I see is the misinterpretation of data. For example, a poorly worded survey may result in unintended responses; or — and I’ve been in the room when this has happened — negative results have been explained away without any further investigation. Thank you so much for sharing this . This article actually caught interest of mine because I am undergraduate in Engineering and recently I seem to have developed some inclination towards data sciences. The DIKW triangle seems to be an effective way indeed for illustrating the whole concept in a nutshell.